For anybody that considers themselves a fan of the great sport of hockey, Christmas came a couple of weeks late as it was announced early yesterday morning that the NHL and the NHL Players' Association had reached a tentative deal to put an end to the lockout, which was standing at 112 days and counting. Now the deal is not quite official, both sides have to put a vote to it, but it does mean that there will be hockey this year with a truncated regular season of either 50 or 48 games to start at some point next week. Here is what this deal means. There will be labor peace until 2020 because the new CBA is a ten-year deal, with the chance for either side to opt after eight years. While there is no telling what will happen down the road in the league's labor relations, the fact that we have an extended time without worrying about a lockout feels great. Maybe Islanders fans will take some solace in the fact that there are now limits on the amount of years on contracts. The limits are now seven years, with an additional year given to teams to re-sign their own free agents. Also, teams are no longer allowed to front-load said contracts thanks to a new variance rule that says that a player's salary may not increase or decrease by 35% from year-to-year and that a salary may never fall below 50% of its highest value. Not sure who Beckenbaugh is? 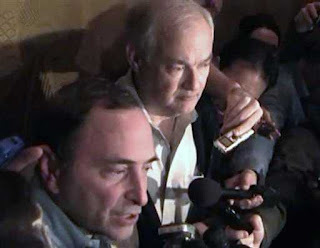 Well if you love the NHL, you should be praising the ground he walks on because he was the man, through his role as a Federal Mediator, brought back the players, and NHLPA chief Donald Fehr, and the owners, and Gary Bettman, back to the table and was able to help hammer out a deal amid 16 hours of negotiations that went into Sunday morning. Considering the hard lines both sides, led out by very strong key faces with major law backgrounds in Bettman and Fehr, the work that Beckenbaugh did was huge and incredibly important. There would not be a season without his work. 4. Are Gary Bettman's days numbered as commissioner? There have been multiple prominent voices that believe that Bettman should step down from the role he has served for 20 years. It has certainly been an up-and-down tenure where he has accomplished what the owners brought him in for, strengthening the league's financial health, which has never been stronger, and instituting a salary cap. But any positive gain during his tenure has been stymied by the fact that this is the third work stoppage during his tenure. Now, the owners are responsible in a way for Bettman's tenure, after all, they brought him in after working under David Stern, a guy never afraid to grow his own power, but Bettman has become extraordinarily unpopular among the league's fans and these work stoppages drive fans away from the league. Fortunately the season was not wiped out like it was last time, which took many years to recover from amid a myriad of problems, including an awful television contract, but Bettman may not be able to recover professionally. It has been reported that the network's ratings have been extraordinarily awful since the Olympics and the biggest reason why that has been the case has been the fact that their crown jewel product has been mired in a work stoppage. The NHL has been a big reason in the network's evolution from the Outdoor Life Network to its current state and while the network's initial coverage of the sport was garbage, it has grown, particularly thanks to its connection to NBC Sports. The fact that a season was salvaged is huge news for the young network.